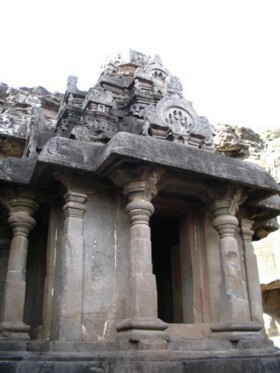 The caves are located at Maharashtra State, Aurangabad District, Khulatabad Taluk , Verul Village. Built during the Gupta dating from A.D. 600 to 1000 , the caves were constructed by digging into a mountain side and removing thousands of tons of rock, leaving only the temple structures behind. At Ellora there are 34 monasteries and temples (12 Buddhist, 17 Hindu, and 5 Jain ) extending over more than 2 km . The concurrent construction and use of these temples by different religions is a wonderful testament to the extraordinary spiritual maturity of ancient India.